Toward the end of each year the publishing world delivers readers reams of the Best of almost everything; short fiction, poetry, essays, science and sports writing (not in a single volume, of course, but there’s a marketing idea), nature writing, beach writing, even how I lost my virginity writing. 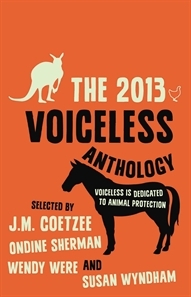 The 2013 Voiceless anthology, sponsored by Voiceless – the Animal Protection Institute – delivers something different. The stories, essays and occasional poem in the anthology, chosen from submissions presented for the 2013 Voiceless Writing Prize, not only support a campaign for the recognition and protection of animals. 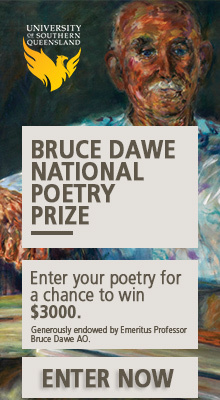 The winning submissions are centrally concerned with relationships between human and non-human animals. The writing ranges from the passionate (Meera Atkinson, ‘Confessions of a vegetarian’) to the eloquent, if painful (Darren Chard, ‘The horses’ and Craig Simpson, ‘The kangaroo’), with a riveting final piece in the anthology, the story ‘Caged’, by Wayne Strudwich. A highlight is the piece ‘They are not voiceless’, authored by a collective of Yognu women of northeast Arnhem Land, ‘three non-Indigenous academics’ – women, adopted into the Yognu community – Bawaka, the land itself, and the non-human animals, plants, rocks, wind and tides it contains. It is a deceptively simple story. Readers are invited to join the authors on the land, engaging with, and living in country. This is a life all about relationships, where animals are both appreciated for their cultural and spiritual value, and hunted, and killed and utilised without exploitation by the Yognu community. What could be mistaken as a ‘Creation’ story is actually the documentation of the presence, and balance between human and non-human species and their place and roles within Bawaka. It is a story of dignity that should leave the more resourced and materially abundant feeling a little embarrassed. ‘They Are Not Voiceless’ is vital to the collection. It underpins the collection by providing an insight into the philosophical and ethical engagement with animals that JM Coetzee states is largely missing from a global society where there is currently ‘something badly wrong with the new world order’ doing wanton harm to animals, and in turn ‘doing harm to ourselves’. The intention of the writing therefore is clear, in both Coetzee’s brief and gently persuasive introduction (presented as a ‘Judge’s Report’), and the words that follow. The writing is occasionally polemical, and all the better for it. The closing story, Caged, is a devastating example of this. It opens by playing to type. A mother and ‘nasty’ stepfather send the protagonist, Justin Lane, away from home to boarding school. At the school he is violently bullied by other boys, in a large part, because of the open opposition he voices over the cruel treatment he witnesses on a visit to a battery hen farm, glowingly approved of by the school’s Agricultural Master. The black hats and white hats are clearly identified early in the story. There are no greys and little ambiguity. The story has the potential to flatten and fall away, as there are no surprises in the seemingly predictable trajectory of the narrative. When Justin teams up with another boy, McNabb, ‘a troublemaker’, toward the end of the story, the scene is set for a joyously romantic Free Willy climax, where all the hens will find their way home to roost and roam free range. But they do not. What Justin witnesses, and what we are exposed to, is the tragic reality of what a bird suffers, physiologically and psychologically, as a result of a life of violent imprisonment. ‘Caged’ is a necessarily distressing story that should shake us into thought and action. But will it? When I was a teenage boy I often skipped school on a Friday and picked up casual work at the local slaughter yard, so I could make some spending money for the weekend. While working there I saw animals treated with systematic cruelty. The distressed cries of pigs, herded into pens, waiting to have their throats cut, was a sound so shocking that it gave me nightmares. But I still ate my bacon, and other meat, harvested with similar violence. I ‘coped’ by willing myself to not think and not remember. By giving voice to the voiceless this important book refuses our collective amnesia. Thank you Tony, thank you Voiceless. I’m sorry, killing without exploiting? Wow, guess I’l just kill my neighbour. Oh don’t worry, I very much appreciate and respect his life.